The Tow Team Warning System or TTWS® can save you time, costly aircraft repair bills as well as protect your companies reputation. In the busy world of aviation, everyone is looking to move aircraft and vehicles quickly. The TTWS® is an absolutely brilliant design that protects both the aircraft and the ground support company from unnecessary damage and costly down time. This “genius” system will more than pay for itself in just a short period of time. 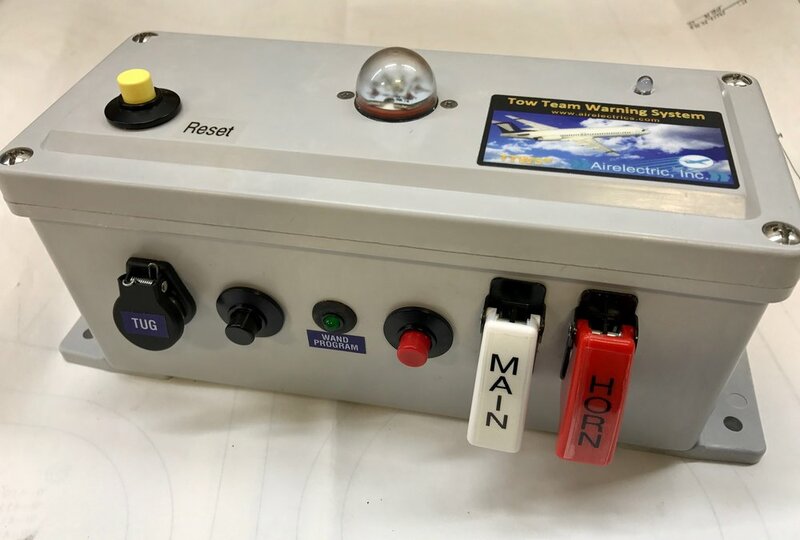 The Tow Team Warning System (TTWS®) comes in two different configurations; PERMANENT and PORTABLE. Both systems are listed below. Each System can be easily charged for wireless and convenient use. SET OF FOUR (4) LIGHTED WANDS. Each with push-button to alert tug driver to “Stop”. Push button will cause lights to flash on tug and aural warning to sound. Blue light illuminates when transmitter button is pushed. Additional lights and cords can be used for greater visibility. Headset options are also available for communication with the cockpit as well as for noisy environments and greater safety. Portable TTWS® installed on tug. The TTWS® can be PERMANENTLY installed on the tug or tow device to use either the rechargeable battery that comes with the system or the tug’s electrical system (12v or 24v). Each System can receive 12v or 28v power from the tug or towing device. Permanent TTWS® hard-wired to the tug's electrical system. Designed by a Master Electrician with over 30 years experience in the aviation industry. Easy to use - Our customers love how easy it is to use. Effective for day, night, indoor, outdoor and inclement weather.